Part one of video highlights from Scottish football's former indoor tournament in 1993. It’s the stuff of legend. 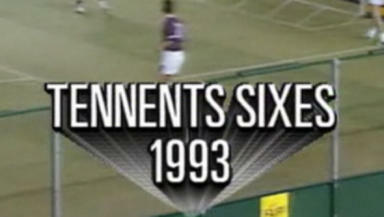 The Tennent’s Sixes was once a regular fixture on the Scottish football calendar, drawing crowds to watch the country’s top domestic-based players battling it out in a high-scoring indoor tournament. First taking place at Falkirk’s Coasters Arena back in 1984, the tournament was as popular as ever in 1993 when 10 teams headed to Glasgow’s SECC to battle it out for the trophy. 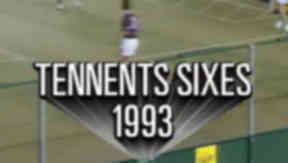 The 10th, and sadly final Tennent’s Sixes, saw the sides split into two groups of five, with the top two teams from each progressing to the semi-finals. Holders Celtic headed up group one, alongside Aberdeen, Falkirk, Hibernian and St Johnstone. Group two comprised Airdrie, Dundee United, Hearts, Motherwell and Partick Thistle. Split into afternoon and evening sessions for the first four rounds of group stages matches on Saturday, the likes of Gerry Creaney (Celtic), Tommy Turner (St Johnstone), Darren Jackson (Hibs) and Tosh McKinlay (Hearts) were all in fine goalscoring form. We won’t post any spoilers of how the first day’s action went. Instead, we’ll leave you to watch the action as it unfolded. We’ll have the final round of group matches, as well as the semi-finals and final, here on the STV Sport website on Friday.